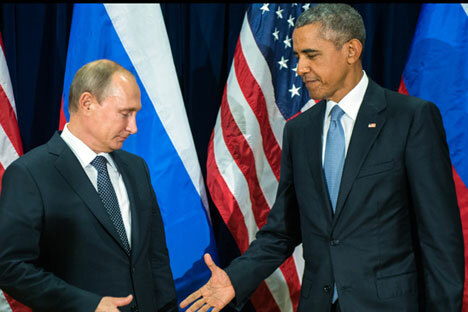 Russian President Valdimir Putin (L) and US President Barack Obama (R) shake hands for the cameras before the start of a bilateral meeting at the United Nations headquarters in New York City, New York, USA, 28 September 2015. The Russian and U.S. leaders have backed the UN effort to organize inter-Syrian negotiations in Geneva, and the Russian president has underlined the need for forming a broad coalition for the fight against ISIS, a terrorist organization outlawed in Russia. "They expressed common support to the UN effort to organize negotiations between representatives of the Syrian government and a representative delegation of the opposition forces in Geneva in late January for the purpose of the achievement of political settlement in Syria in line with UN Security Council resolution 2254," the Kremlin press service said in a report posted after a telephone conversation between Vladimir Putin and Barack Obama. "Vladimir Putin once again accentuated the need for creating a broad coalition for the fight against ISIL and other extremist organizations and stressed the topicality of the soonest drafting of the lists of terrorist entities and the refusal from double standards in the classification of particular groups," the report said.